A week ago, in the post London, i wrote that i will be going to the Scritti Politti gig on February 5 next week Friday. I have a ticked, i booked the bus and a place to spend the night, only a block away from the Roundhouse. I did write about a dream i have in The world and the people. I will take the drawings with me. I will try to talk to Green. I will try to give these drawings to him. I don’t know if he will accept them. I hope i will keep myself together. Sometimes i think that it is just a small thing. 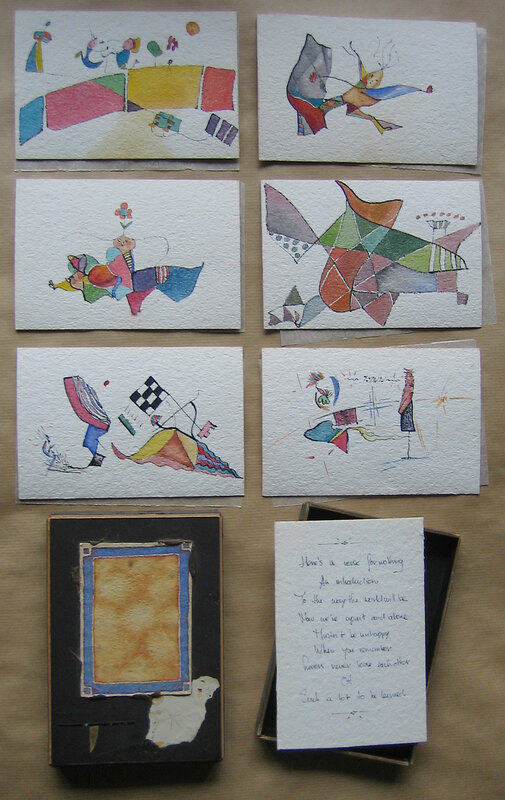 These are simply small drawings i made almost thirty years ago. But to me they are not small. They have been a part of my life for all those years. And their meaning has grown for me. I did write to Rhodri, who is in the band, in November 2014. I did send links to the pictures with that e-mail. He would ask Green about it, but warned me that he was not very good in replying to e-mails. He never did. This is difficult for me. I hope i can make this work, somehow. I know i have grown over the past year. That will help me. I am scared, yes. I don’t see how i could not be. One part of me wishes this was over and done with. Another part wishes to run away and lead my own life. Another part wants to stay here at home forever. But even though this is scary, i know i will go to London and i will try to give these drawings to him. I can only hope he will accept them.